Our team of GroutPro Tile and Grout Specialists in Sydney’s Western Suburbs are experts in tile and grout restoration, glass restoration, anti-slip treatments and much more. David at Wetherill Park also covers from Smithfield, to St Johns Park through to Edensor Park and surrounding areas. David offers tile and grout cleaning, grout coloursealing services and much more to transform your old, stained tiles on floors, bathrooms and kitchens back to looking brand new again AND save you money at the same time. Fully trained and qualified in tile and grout cleaning; tile repair; glass restoration; grout coloursealing; slate and stone cleaning etc, David offers a no obligation quote on inspection of your property or home. They’ll offer help and advice on all types of tile and grouting work needed for your situation. If your home is looking sad from dirty stained tiles and grouting and you’ve been thinking of a total refurbishment, think GroutPro. Weighing up the costs to service and clean your current tiles, recolour the grout and restore the shine and lustre to your glass shower screens and windows may be all it needs. Check out some of our before and after images in our Gallery of recent jobs by our teams. The Gallery features some bathroom and kitchen makeovers along with general tile restorations and re-grouts. If your Grout is clean and in-tact but simply suffers from unsightly stains and blemishes, there is a cost effective solution. At GroutPro, we call it ‘Colourseal‘, more commonly know as grout colouring or grout re-colouring. The finish it achieves is like bringing a whole new look to the tiles. Similarly Re-grouting must be done by a professional to achieve that perfect finish – no messy marked tiles or finger prints. 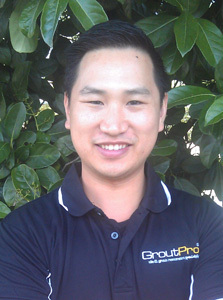 If you do need a re-grout, your GroutPro specialist is fully qualified to do the job and can advice you along the way. Don’t spend more on a tile renovations or unnecessary tile re-grouting, get the Grout Specialists Sydney to take a look and give you an obligation free quote. GroutPro Tile and Grout Specialist carry the best re-grouting tools to do the job right. We’ll give your tiles the perfect finish with our re-grouting tools and unique products. Our Tile and Grout Seal will ensure the tiled area is sealed to give the grout longevity and stop staining, such as in high wear and tear areas like kitchen splash-backs or floors and mildew effected areas such as around the bath or shower. If you’re looking for excellent customer service and exceptional workmanship GroutPro is here to help. Our range of unique eco friendly cleaning products are an essential range to help maintain your tiles and grout. 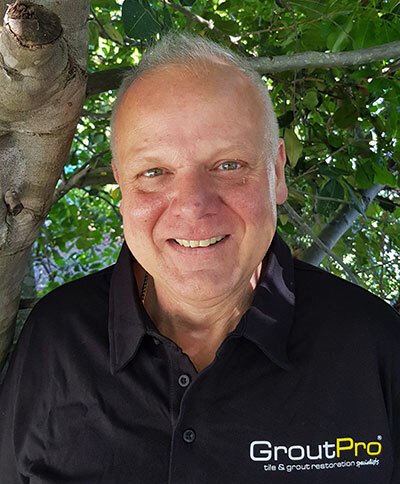 David and his team is happy to assist you with all your needs for cleaning products and will have the right product for any job they undertake at your home. See more details on all our GroutPro professional Tile and Grout Cleaning Services and speak to David, your local GroutPro Tile and Grout Specialist. He can help with all your tile problems and provide tips on cleaning and maintenance. Please contact David for an Obligation Free Quote today. The best in grout and tile cleaning Sydney has to offer. If you’re looking for tile cleaning in western Sydney, please feel free to fill out the Quick Quote form to the right and a GroutPro Tile and Grout Specialist will get back to you within 24hrs. We offer an Obligation FREE Quote for all jobs.